Italy has a problem. It's national politics have now been handed over to a technocrat to fix and it sits precariously looking into the dark heart of major financial and national economic disaster. In a three part series of short blog pieces (I promise I'll try to keep them short anyway) I'll try and explain the situation the best I can, and why I personally believe that it is one country which has the capacity to live up to its future hopes. Italy's largest dogma in recent history has been the political leadership of one man. A man whom many saw to be the catharsis to avoid the situation that Italy has plonked itself bang in the middle of. And sure enough, like every good politician to boot, Silvio Berlusconi led in the path like many before him, securing his future before that of the people. 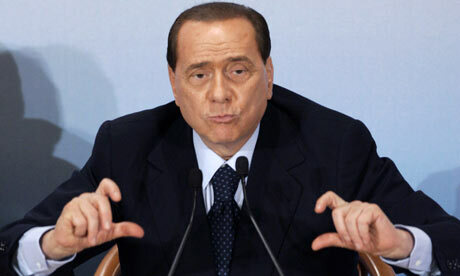 Now, it's all fair and good to blame Berlusconi for all of Italy's woes. But the last time I checked, he wasn't also responsible for the lack of fiscal or political reform, indeed Italy hasn't had such reforms for 40 years. He certainly could have pushed these through, and with the majority acquired in 2008, he could have done it within 40 minutes, the blame lies squarely on the shoulders of the ministers that didn't push for it hard enough. Berlusconi's alleged womanising aside, a case which I may also point out was the focus of attention of opposition parties, rather than the state of the economy or any other issue affecting Italy; this was always going to be an issue which most Italians would have brushed aside. Fellini famously said "an Italian is capable of loving his mistress and wife whilst his wife is capable of loving her husband and lover". Once again, hours of TV interviews all clambered on these issues rather than those of the nation. The early 90's, when Berlusconi first led himself into power, were ones where Italy could have really brought Italy to the precipice of Europe. With manufacturing output at it's highest and a level of tourism peaking (in large part to a weak lire) Italy could have really capitalised and focused on becoming the manufacturing state of Europe, a leader in the export market. (Ironically Italy exports 4x more than Germany, even in this climate, only poor policy and fiscal red tape means that it is not having the positive effect on the economy that it should be) Instead, Italy became engrossed with the idea of becoming the service sector state, and it faced competition from the UK, Germany, France and even Spain. Once again bad policy prevailed and leads Italy into 2012 trying to undo the work of 17 years in few months. For me, to have a scapegoat is never the solution. It's an excuse for disaster; it takes away the responsibility and joint blame of others responsible for the mess. They are not responsible to the electorate. The anglo saxon system where you write to your minister, get a response, even visit during "studio hours" is simply not available. This is because in Italy you don't vote for the minister of your town, you vote for your party, and the party of your region. They in turn decide who gets chosen and how many representatives they have. They have a full pension after 2 years. And it's a final salary pension. Some members of parliament have only worked as "secretaries" for 60 days and are entitled still to a monthly wage of €3000. A recent case was for someone who worked 65 days, 7 years ago and has been paid by the state every month without fail, a wage of €3500. A recent vote was placed to the senate to get this changed. 22 voted in favour of abolishing this....GREED. 418 voted against. Ministers get paid to go on TV. That's correct, whilst they spout vitriol against others and diatribe about there own great policies, these ministers, who are not responsible to the voter and have a full pension after 2 years get to actually appear on TV and get paid for the pleasure; somewhere in the region of €600-€1000 per appearance. The list can keep going on, but you get the picture. There is never a common consensus. There is never sense spoken in the lower chamber of parliament. This is a political system which has systematically eroded the hope of those looking to support families, start new jobs, develop an economy and provide a future for a country which promises so much. As Ghandi said "What is true of the individual will be tomorrow true of the whole nation if individuals will but refuse to lose hope." Lets hope it's not too late. "For me, to have a scapegoat is never the solution. It's an excuse for disaster"...AMEN!!! I think Italy's problem was NOT Berlusconi, but Italians themselves. We have great resources but we don't use them properly, we waste what we have. The three points you talk about above here say all...Our sistem DOES NOT work!It MUST be changed as soon as possible but we all know it won't happen orat least not soon, but there's no time anymore. That's why i think the only solution for an italian is to leave Italy.